Did you remember about GSC’s product re-sale polling that was conducted as part of their 10th anniversary campaign? Yep, that particular voting had come to an end since May 1st, and fast-forward to today, it has been two weeks since then. Well, what do you think about the result, Nendonesian? 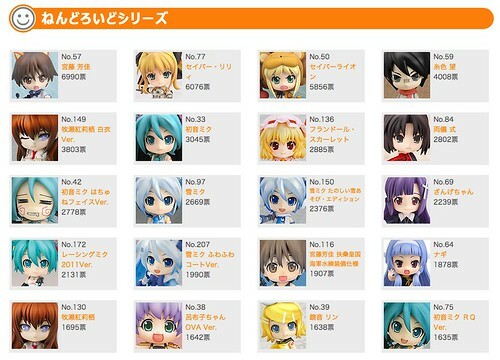 This entry was posted in News and tagged gsc, nendoroid. It’s pretty unlikely, because Nendoroid Hatsune Miku has been re-issued several times already. Quality problems? o_o I heard a lot of people had problems with miku’s “^^” face? Will they also show what they picked or approved for the new product request??? I have a feeling that some people were voting for Miku just because it’s Miku.I can’t think of any other reason why basic Miku would be up there.This was a chance for hard to get figures to get a re-sale and the majority of them are Miku.The only one that is a must have for me is Itoshiki Nozomu. Yes! Snow Kaito… Snow Luka…. we need something like that! I would love it if they made snow versions of other vocaloids and not just Miku….I want Snow Kagamines!